These findings measure 20mm long by 14mm wide by 2mm thick and the holes measure 2mm. 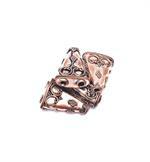 These findings are made of sterling silver with solid copper plating. There are 4 of these sterling silver findings in a package. These findings measure 20mm long by 14mm wide by 2mm thick and the holes measure 2-3mm. These findings are made of sterling silver with solid copper plating. There are 4 of these sterling silver findings in a package.